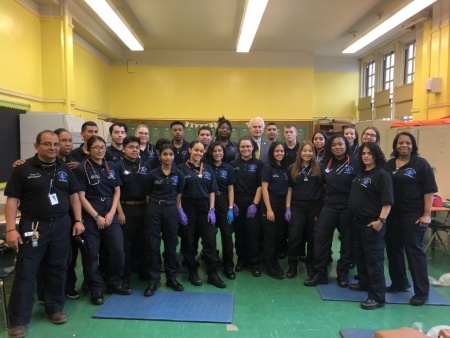 Grover Cleveland teacher Edwin Pacheco, who leads the EMT class, said he learned back in September that the program, which prepares senior students to take the State EMT certification exam, was on the verge of being cut due to a lack of funding from the Department of Education. Students and staff began writing letters to Mayor Bill de Blasio and Department of Education Chancellor Richard Carranza, trying to save the beloved program. Weeks went by and neither official responded to the school’s requests. Holden was able to allocate $5,000 from the City Council budget to fund the school’s program, which boasts a 100 percent certification rate, meaning every student to date has passed the State exam. 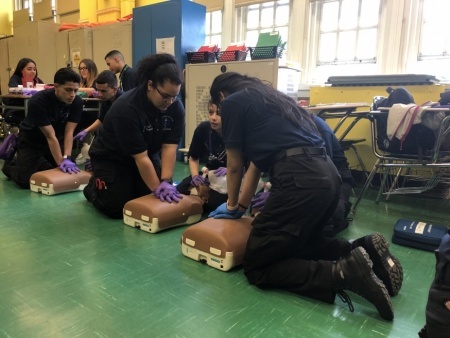 To ensure this, Pacheco and New York State EMT Certified Instructor Karen Moreno provide the students with robust hands-on training both inside and outside the classroom. Every afternoon, the class of 21 students—the largest cohort in the program’s history—meets to learn and practice new skills including trauma assessment, CPR, splinting, pharmacology, and much more. Each student also completes two 12-hour shifts with partnering EMTs, heading out on the EMT ambulances and responding to calls. Students have had the chance to get first-hand experience responding to calls ranging from women in labor to gunshot wounds. One student, Kamila Grala, while responding to a call at a nursing home, performed CPR on a man and was able to restore his pulse which had previously flatlined. Grala says she plans to become a doctor and appreciates the real-world experience the Grover Cleveland class is able to give her. 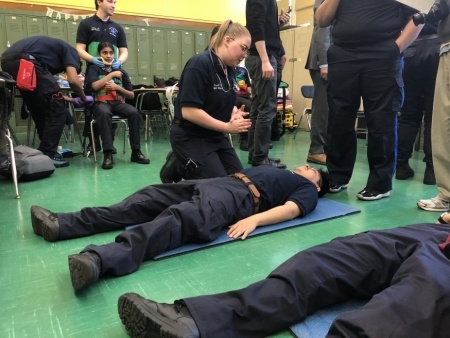 Past students of the course have gone on to become EMTs with the FDNY, various ambulance companies, and one student has even worked as a combat medic. For many of the students, the class presents a stable career path, while for others it gives them a reliable source of income to help pay for college. Holden paid a visit to the school on Friday and was met with applause. The council member also told the staff and students that he is continuing to advocate for higher pay for EMT workers. The students at Grover Cleveland will sit for the State EMT exam on June 20. Once certified, they will be able to take jobs as EMTs.